The Alyn Foundry IF Allman engine. Several months ago I was asked by Jason about the Isaac F Allman kit that I advertised at the turn of the last century. 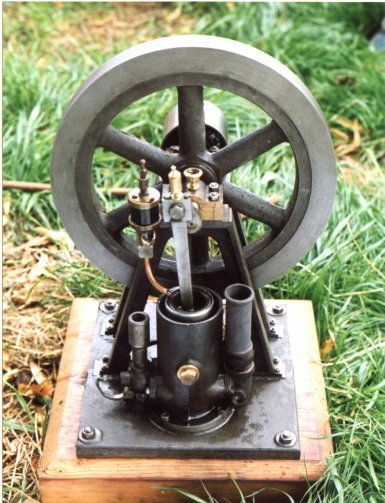 This engine was scaled from a pair of Patent drawings that accompanied Mr Allman's original application. 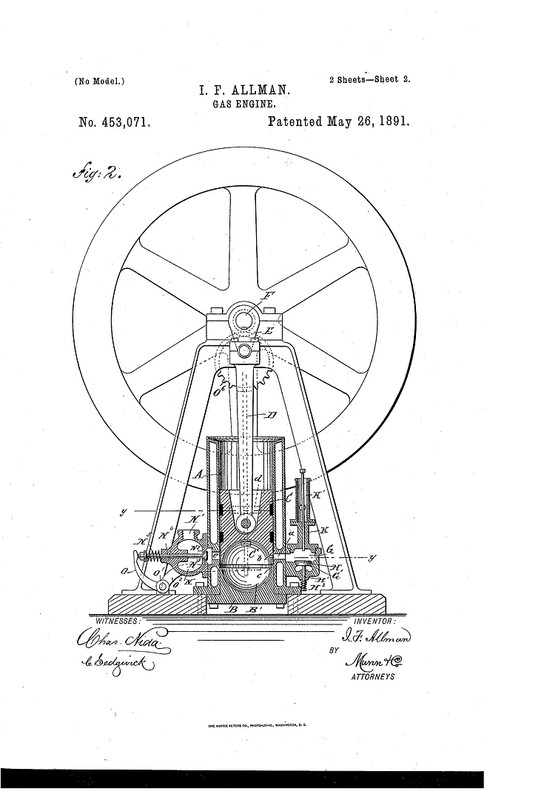 Alyn Foundry had already done a " loose " replica of the Allman and Thompson vertical gas engine, Vincent made the patterns from a full page illustration. Being a large model, like the Retlas, few kits were sold. A former customer, Mr Kipling from Darlington had found pictures of the IF Allman and was telling me about them at one of the 1000 engine rallies held each June. He described an almost unique design for an IC engine that used " A " frames to support the crankshaft and flywheel, I was intrigued. John promised to send photocopies as soon as he could. He did, the following Tuesday morning saw a large brown envelope arrive with the whole patent specification inside. I showed the pictures to my wife who remarked how nice it looked and suggested that a model should be made. Using the flywheel as a datum I then proceeded to measure every part of the drawing to make patterns to. Knowing the main capabilities of model engineers, back in the day, a maximum of 12 inch diameter was chosen. This also helped me as I had got a pair of Aluminium masters from our Gardner kit that I had managed to " screw up " having made the inner rim too narrow. These were gently massaged into a new pattern for the Allman engine. The rest of the engine was pretty straightforward, chunks of wood were screwed together to make " split " patterns and very quickly the two dimensional paper plans became three dimensional objects. It has to be said that at this time in my life I was " off sick " from work. I had suffered a series of " chest pain " incidents and my doctor suggested some R&R! To each, his own, this was my kind of R&R!! It came back and bit me very hard much later, but that's another story. After a couple of weeks most of the wooden patterns had been made and converted into Aluminium masters. The fun part starts. I took the patterns to Rhuddlan and with the help of the lads there moulded and cast all on the same day. I remember having a box full of very hot castings buried in sand to prevent chilling, coming home in the back of the minibus we used to have. At this time I had acquired a new, to me, Knight of St Louis jig borer. This machine had been sort of converted into a milling machine. With this machine I drilled the 16 holes that were used to attach the " A " frames to the base casting. Using nothing more than the X and Y dials I managed to accurately achieve a situation that I'd never had before. I was able to fit either " A " frame onto either pad, in both directions!! Within a couple more weeks the completed engine was ready for running. 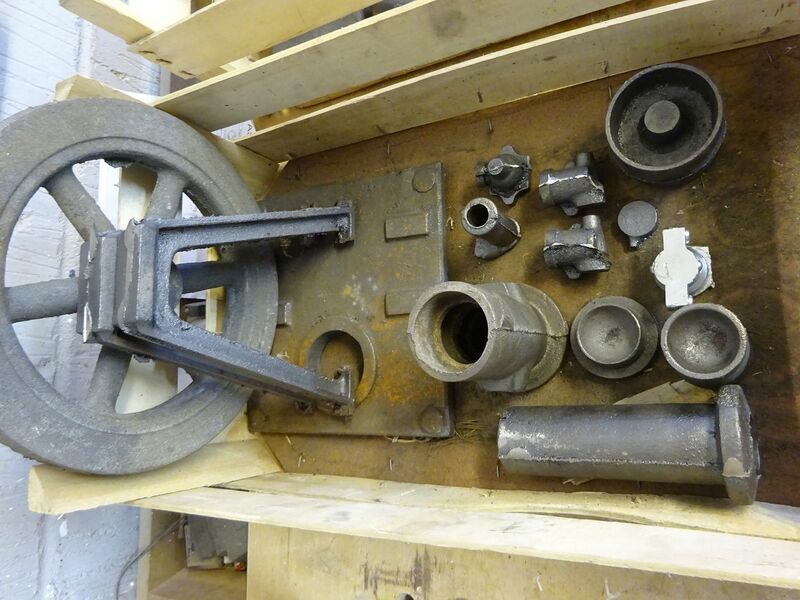 In that time I had made patterns and cast the Bronze bearings in my backyard foundry, made a Steel mould to diecast the fiddly governor yoke. And also cut a pair of 15:30 ratio gears at 22DP. Time was marching, by now I had set my sights on showing John the finished engine at the Astle Park steam rally in August. Literally 5 weeks after receiving the patent drawings. It took me two days of time to finally get a single chuff. The reason? Mr Allman hadn't realised that the piston would cut off the passage to the ignition tube due to his " special " spherical combustion chamber design. A very quick and dirty slot was cut into the side of the piston and hey presto the engine ran for its first time. I apologise for the rather lengthy introduction to this thread but I felt a little history was in order. I know that three major contributors to this forum have now got sets of castings, one in particular is also going to do something that never got done in the beginning..... The drawings!! Much more to come, cheers Graham. Re: The Alyn Foundry IF Allman engine. The attached picture above is Vincent's original A&T which, if you look closely has a sideshaft. This sideshaft was hollow and carried the flyball governor control rod. Vincent sold on this engine many years ago, I wonder where it is now. I'm hoping that my fellow contributors can furnish some extra pictures of this project as at this moment my PC is lying dead after the last update. Nice looking engine, reminicent of a inverted steam layout. 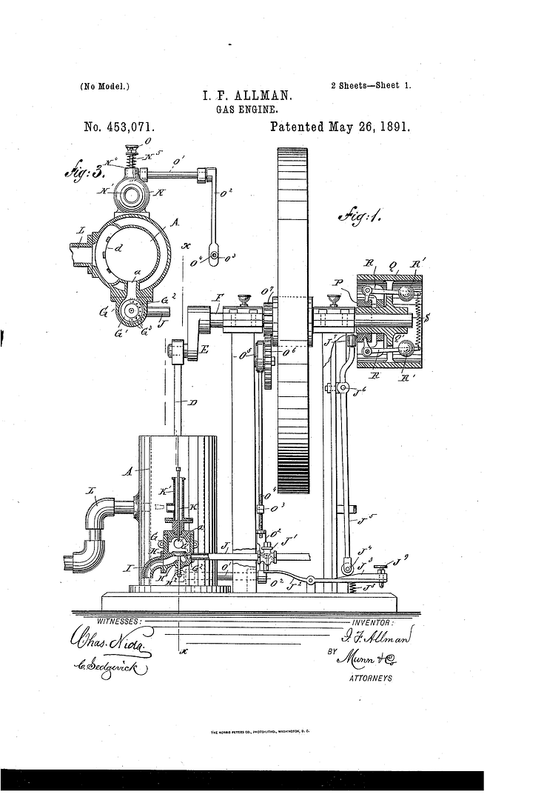 Maybe worth putting up the Patent Drawings first to see what Graham had to work from. I have also attached the Patent in PDF form which has a description of the engine and explains what all the lettered parts are. 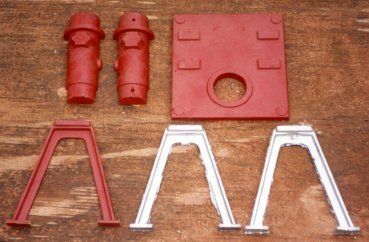 I collected these castings at the Bristol show from Andy B who had kindly acted as courier for Graham, not upto the old Alyn foundry standards but mostly usable after some serious fettling. I have made a little swarf to see what the iron was like and also made a tentative start on the drawings. I will be making one or two alterations from Graham's model as there are a few things on the Patent drawings that I see slightly differently but all in all it will be very similar. I really appreciate your last post. I'm having to work with limited capabilities at the moment. I'm hoping to get a short video in HD done soon of the engine running. I was particularly proud of the tiny gas ring burner that provides the heat for the ignition tube. It took me two days of time to finally get a single chuff. The reason? Mr Allman hadn't realised that the piston would cut off the passage to the ignition tube due to his " special " spherical combustion chamber design. Or was it that Mr Corry did not look closely enough at the Patent drawings particularly items "b" and "c"
You mean the small igniting-port b and the feed groove c.
Gearing is simple enough, just need the main bearing castings so I can get crankshaft height and that will allow me to work out where to place the pivot for the larger gear. Jo & Andy, do you have 22DP cutters or would it suit to go with the more common 24DP and add a couple of teeth? Jo, I take it you like the rather " coarse " tooth form depicted in the patent drawings? As you're aware a finer tooth count helps with valve timing but this engine is pretty forgiving as there's masses of adjustment available. Jason, the sun has appeared but my son has disappeared, MOT time. Fingers crossed for a video later on. I have no experience of gear cutting only read the book. I hoped to rely on obtaining suitable gears from HPC. I do it gives it character and will make the gear teeth look chunkier relative to the size of engine. It looks like the original engine had 24 teeth and 12 teeth on its gears so I will have to do some calculations as to which DP should be used to get it to look right. 22 is one of the few DP sets I don't have but these will be cut with wider teeth to get them to look right. May be worth making a special cutter with a lower angle or getting a clock gear cutter, 14.5pa would look better than 20pa from HPC, HPC also don't do 22dp. For the sake of an extra 1/4" of material some additional gears may be found. The patterns have arrived at the Brass foundry that I've been using for the last 35 years. I'm asking them to forward directly to you three as soon as they're done. I had to make new patterns for the Brasses as the original ones have gone missing. The new patterns are made from 1/2" thick Nylon sheet so that should give you an idea of finished thickness? Whilst in the workshop I came across the 12 tooth gear for the Robinson " X " type. What about them? 12:24 1.75 Mod. The 12 tooth gear is capable of being bored out to 1/2" diameter to suit the Allman crankshaft. Bad Behavior has blocked 13131 access attempts in the last 7 days.